I finally decided to do some quick summary reviews and thoughts of the anime from Autumn 2013. Aoki Hagane no Arpeggio: Ars Nova  - Who doesn't like battle ships that turn into cute girl personas that start firing weapons at each other? BlazBlue: Alter Memory  - An anime based on a game in which people with superpowers battle each other. The story is too confusing. Coppelion  - Too many annoying characters that either are overly dramatic or cry a lot. Freezing Vibration  - Loads of plot. Story was bleh. Some conspiracy that happens in some factory that lasts 12 episodes. Gingitsune  - An interesting slice of life anime about the daily life of a shrine maiden girl. 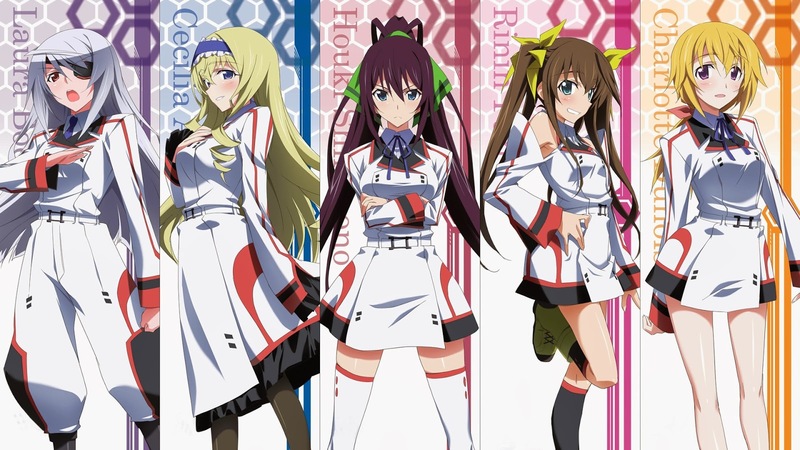 IS: Infinite Stratos 2  - Fanservice. Plenty of fanservice. Kyoukai no Kanata  - No idea what's happening - bam! oh...that ending. Kyousou Giga  - Confusingly awesome. You are in for some total randomness and 13 parallel universes. Machine-Doll wa Kizutsukanai  - Hnng! Miss Monochrome  - Life of an android idol is pretty tough. Outbreak Company  - Hilarious parody of otaku life. Walkure Romanze  - Jousting. And boring harem. Yuusha ni Narenakatta Ore wa Shibushibu Shuushoku wo Ketsui Shimashita. - Hahaha. What's next? More fanservice.